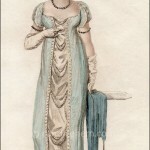 La Belle Assemblée, October 1819. The last few years of this decade saw some of the tiniest bodices, at least as represented in the fashion prints. 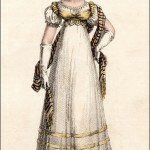 To compensate for the short bodice, the skirts took on complicated flounces. 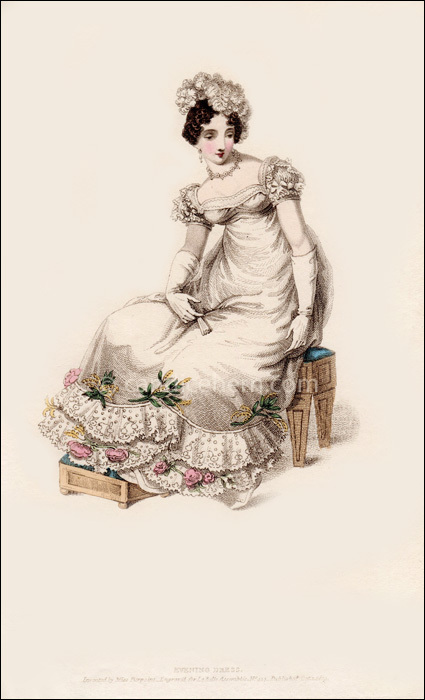 “Dress of fine net over white satin; richly flounced with double festoons of very broad blond; the lower festoon interspersed with full blown roses, the upper one surmounted by lilies of the valley. 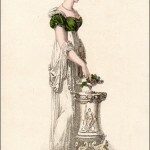 Plume head-dress, consisting of numerous white down feathers floating over the hair, arranged in full curls, and depending partially over the left side of the head. Diamond ear-rings and necklace. White satin shoes and white kid gloves, with carved ivory fan.